The process of producing any manufactured product requires energy. This is referred to as "embodied energy." It's really a very straightforward concept: the higher embodied energy the more potential negative impacts on the environment. Cellulose Insulation is an extremely energy efficient product in its production process. "R" for "R" it takes at least ten times more energy to make fiberglass insulation by melting sand or glass in gas-fired furnaces than to manufacture cellulose insulation in electrically-driven mills. Foam insulations contain approximately 60 times as much embodied energy as cellulose insulation because they are made mostly from petroleum. All three vehicles will get you where you want to go. 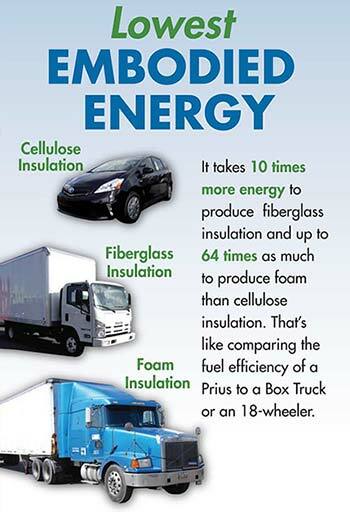 Cellulose Insulation is like the vehicle that gets 30 miles per gallon. But this analogy goes even farther. Decades of real world experience demonstrate that cellulose-insulated houses typically require 15% to 30% less energy for heating and cooling than homes with insulation batts. It's as if car "A" were a hybrid 30 mpg vehicle that goes 150 mph (without lowering its fuel efficiency), while vehicle "B" is an under-powered economy car that struggles to get up to 60 or "C" is a tractor trailer rig.